1. Year of Hair Accessories: Last year, one of my resolutions was to always wear sparkly nail polish. It started out great, but it became a nuisance. I am a person who changes my nail color every week, and for those who have dabbled with wearing sparkle nail polish, you can share my sentiment on how difficult and annoying it is to remove. So after 5 months of trying, I decided to lay off the glitter. This year is all about the hair. It is no secret I am obsessed with my hair. Not in the vain way you are thinking. I just love to explore my options and play around with it, especially when I was younger. 2012 was a sad year for GG lovers. I was, and still am, obsessed with Gossip Girl. I started watching it from the very beginning and felt that I have befriended the characters in the show and that we grew up together. Granted, I didn’t end up marrying a prince, become the president of a newspaper at age 24, or own a hotel like my friends in Gossip Girl, but I still feel like we are all connected. 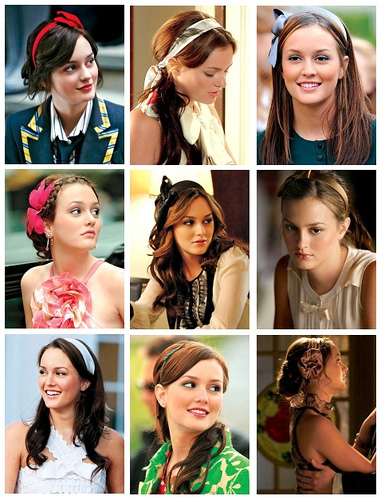 Nonetheless, my favorite character on that show is Blair. She is always scheming and she is always looking good in doing so. In their world of hierarchy, the headband defines the one who rules all. Well, I didn’t have a “Princess becomes a Queen” party for my 23rd birthday for no reason. My resolution wasn’t just to wear any old headbands. I wanted to wear bedazzled and show stopper head pieces. Recently, I have been making my own head pieces. They make anyone feel and look like a goddess, and I am all about that. Since I’ve made that resolution, I have worn a very few number of head pieces when out. I presume that I don’t have to wear a head accessory EVERY single time I am out. I do have a big head. I am prone to headaches. 2. Learn Two Languages: I love to learn new things and I figured this year I want to expand my cultural horizons. Perhaps, I would spruce up two languages that I had once learned in the past. Hopefully, it will help me be like Carrie Mattison from Homeland, without the tears. Like every young adolescent, in school, we had to take a language. I chose Spanish, and from what I remember, I was pretty darn good at it. I thought it would be a good idea to revisit the past and firm up my Spanish skills. When I use to go to Sunday school, I was taught how to read and write Arabic. It is a beautiful language and beautifully written. (Hence, why I have a tattoo of such). I figured that these two langauges are a good starting point for my international lifestyle. I am trying to rack up my languages. I have yet to purchase the Rosetta Stones for these languages. However, I have been using words such as taquito, quesadilla, chonga, chongalicious, mamasita, and Spanish words along those lines. As for my Arabic skills, I have recently been very much intrigued with Homeland and they speak a lot of Arabic in the show. I can recite some lines, but those religious days are far past me. 3. No Clothes for 3 Months: I knew I was kidding myself when I made this one. Like said before, I am addicted to spending money. Let it be fifty cents or hundreds of dollars, I love it. I told myself that I would not buy clothes for three months, up until my birthday. It would serve as a reward of getting fit and keeping up with my resolutions. Unfortunately, it took about 19 days for me to break. I knew going to the mall with Maggie was a bad idea, but I thought I had self-control. The thrill of going up to the register and having the sales associate ring up all the fabulous things I found is what I live for. I did some serious damage that day. Since then, I have continued to go on this downward spiral. I had to purchase an extended clothing rack a few months back to hold all my new clothes because my walk-in is completely packed. The. Rack. Is. Full. I sound like I have some major hoarding issues, but I don’t. I just love clothes and buying them. This past Saturday, Camille and I went to the mall to get our vacation shopping on, and every store that we went in, I ended up buying some. We even went to Pac Sun, and I purchased a few things. Camille says that every time she’s with me, she ends up spending a ton of money. I am a bad influence, but I say, don’t worry about the cash flow if you are having boat loads of fun! 4. Try to be a Classy Girl: Every year, I try to lighten up on the partying. I am about to be 25, and I want to avoid blacking out so frequently. In my head, I envision myself at a fancy lounge where I can drink my martinis and meet some hot toddies. It starts out that way. Then, I just want to keep hanging, which leads to my weekly trip to “Blackout City”. I figure until I turn 25, I can act a fool, but after that, we’ll see what happens. GOL! Can’t make promises. Since that resolution was made, I have made it through two weekends without blacking out, solely because I wasn’t drinking. YIKES! On aside:: I am really loving country music these days. Especially, after watching Country Strong and being a huge fan of Nashville. Here’s a song by Miranda Lambert. I never thought I would say it, but I really enjoy this country song! Not that I know of, but you can share your thoughts here.